On the day of the kickoff, our team woke up early for the FIRST robotics live stream. This live stream would include the game reveal, which presents the objective of the game and the point system. 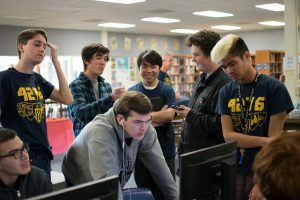 This game definitely led to the team to come up with strategies that focus on different aspects of the game; the team realized that this game really puts the “teamwork” in “STEAMworks”. The second challenge for the team was designing a robot to complete the different objectives in the most efficient way. At the end of the day, the team went home and the officers even continued discussions!